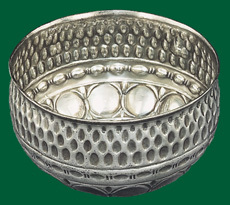 The decoration of this juglet has close parallels in the relief designs on a pair of bowls in a hoard of silver vessels that was found in 1883 at Chaourse in France. Hoarding of this kind was a consequence of the economic crisis that afflicted the Roman world during the middle decades of the 3rd century A.D. So we can assume this glass juglet was made in those troubled times. 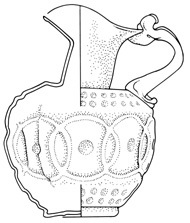 The recurring “circles-and-dimples” motif that runs around the body of the juglet suggests that both it and the Chaourse silverware were attempts to imitate elite, shallow-faceted vessels that had been painstakingly sculpted from rock crystal by lathe-cutting and abrasion. Rock crystal was valued even above gold in Roman times, so it is unlikely the glassworker actually ever saw such vessels. But glass workshops may well have had pattern-books for each motif that was in-vogue among the wealthy. Alfody, G., 1974: “The Crisis of the Third Century as seen by Contemporaries,” Greek, Roman, and Byzantine Studies 15, 89-111. Charleston, R.J., 1964: “Wheel-engraving and ­cutting: Some Early Equipment,” Journal of Glass Studies 6, 83-100. Harden, D.B., 1987: Glass of the Caesars, 207-237 (Milan: Olivetti). Oliver, A. Jr., 1977: Silver for the Gods, 167-169 (Toledo: The Toledo Museum of Art). Oliver, A., Jr., 1984: “Early Roman Faceted Glass,” Journal of Glass Studies 26, 35-58. 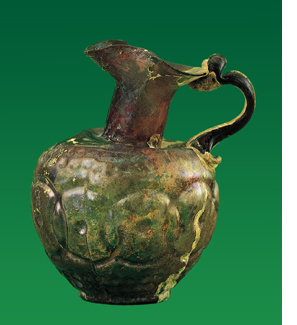 Stern, E.M., 1995: Roman Mold-Blown Glass, 188-195 (Rome: "L'Erma" di Bretscneider). Vickers, M., 1996: “Rock Crystal: The Key to Cut Glass and Diatreta in Persia and Rome,” Journal of Roman Archaeology 9, 48-65.